I've recently rekindled my passion for painting landscapes. With these oil painting tutorials, I want to help you discover that same passion. 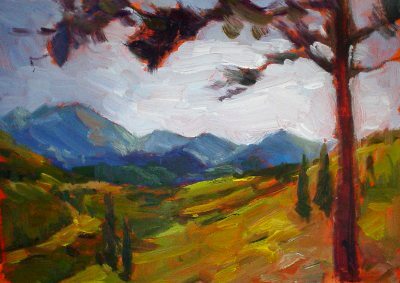 On this page, I'll give you a step-by-step overview of how I create a landscape painting in a short period f time. After you have gone over the tutorial, you'll be ready to go out and try it yourself! Oil Brushes—one flat, a few filberts, a long pointed round for sketching, and another small round for details. Oil Paints—lemon yellow, cadmium yellow medium, alizarin crimson, ultramarine blue, cerulean blue, and titanium white. A gessoed acid-free matboard 6”X 9” (15cm x 22 cm). Use a viewfinder to isolate and crop the subject. Do a few thumbnail sketches to determine value relationships and composition. Lay a thinned wash of cadmium orange on the gessoed matboard and let it dry overnight. 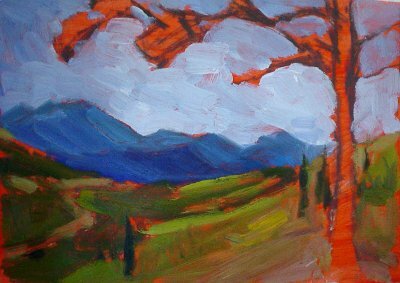 Orange (or a similar warm color) is my favorite undertone for landscapes, because it complements the blues and greens of a typical landscape painting. This is the view I have chosen for this tutorial. It's a pretty well balanced composition, but not quite there yet. When I am using a photo, I always keep the limitations of the camera in mind. As a result, I don't try to copy everything in the photo. Also, remember that there's no “perfect” view in nature. What pleases your eyes when you are right there looking at it might not translate well when placed onto a two dimensional surface. Many times, to make a stronger painting, you need to shift a few elements here or there. Or, simply eliminate a some things to make the composition simpler. Like professional writers, we have to 'edit' the content before we commit it to the canvas. After deciding on the view and sketching out several possible compositions in my sketchpad, I look over my options and choose one of the roughly drawn composition drawings to work from. Using a small round brush, I begin to loosely sketch the large masses of my subject on the board. I start from the top of the board - the sky in the background. I mix cerulean blue into white for the sky, without using any solvents, and I apply it with my largest brush. I vary the shade by adjusting the ratio between white and cerulean blue. 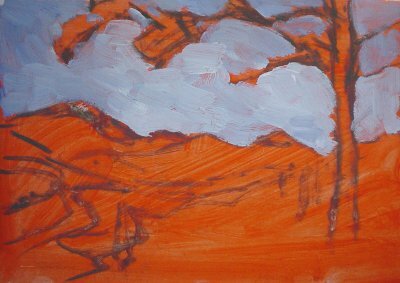 When painting landscapes, I always start with the sky first because I want to keep that area clean. I work roughly around the silhouette of the tree. I prefer to work in a top-to-bottom, back-to-front sequence so as to keep the colors as clean as possible. In other subject matters, such as still life and portraits, it is not as critical that I do this, but I still generally do. After the sky, I quickly lay down the other major shapes grouped by tones. I work on the tree around the sky. The color of the sky is carefully worked around the tree. Still using a big brush, I lay down flat colors for each designated shape. No details at this point. I stay focused and cautious during this crucial stage; if I begin with strong abstract color shapes, I am on the right track. So, for now, big shapes are good, and fewer shapes are even better. The mountains in the background are bluish. As they recede, their colors fade. This is “aerial perspective” at work. I add white into blues and then gray that with some orange or gray (if it's at hand). If I take the time to mix the colors right, I can create an illusion of depth and distance. I close my eyes halfway to 'edit out' the distracting details. I step back and look at the painting from a distance. If the relationships among the big shapes is good, then it is time to move on to add some refinements. There are many shapes in the meadow. I look for them differences of color and tone. Mostly, it is the tone that draws my attention. I mix my colors accordingly and lay them either next to or on top of the previous colors. One color - one brushstroke. It is tempting to drag a color around until it is no longer separate from the color next to it or underneath, but brush strokes have to be bold and definite--placed with a purpose. So resist the temptation to push the colors around too much. At the same time, I vary my brushstroke to create more interest. At this point there is still no need for solvents. The paints are getting thicker as more layers are laid down, but I intend to create no more than four layers of paint before I stop. Otherwise the colors get muddy and look overworked! It's time to refine the distant hills. 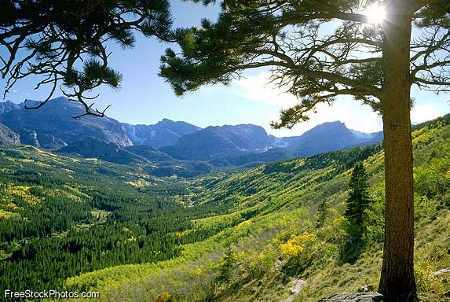 Previously I treated them as part of the mountains. Now I want them to show up by making them greener and darker than the more distant terrain. They still have to be more muted than the meadows, however—and darker too. I have to judge the tone by comparing with the rest of the colors and values around it. I next use smaller brushes as I add details and refine shapes. I start to refine the big tree on the right. I add enough details to suggest the foliage, without getting bogged down in the details. 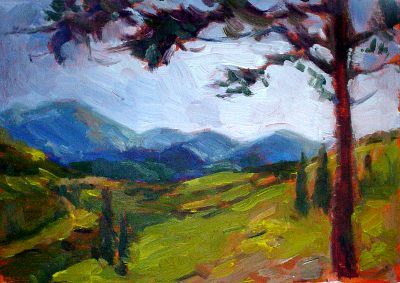 I finish this oil painting sketch by using my finger or a clean brush to soften the edges of the mountain ridges against the sky. At the same time, I want to keep the tree sharper, because it is in the foreground. Edge control is usually the last step of my painting process. This way a visual path is created and the sense of space and depth is enhanced. Notice that I have added two small trees to counterbalance the big tree in the foreground. I finished this oil sketch less than one hour. 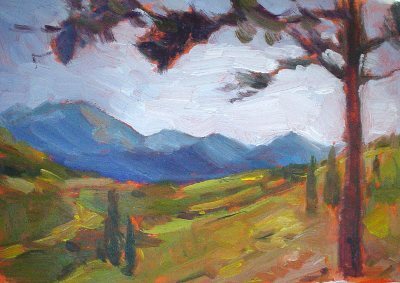 When I began painting plein air many years ago, I would sometimes spend two, or even three, hours just trying to get one tree to 'look right'. When you're working a small painting for so long in a single session, the overall result usually looks overworked; the sense of spontaneity is lost. By doing thumbnail sketches ahead of time to develop a better composition and limiting my working time, I know that I won't exceed the limitations of working fat into fat, or alla prima fashion. As a result, I usually end with a pretty strong painting. I can either use this small oil sketch for a larger painting, or just leave it the way it is. 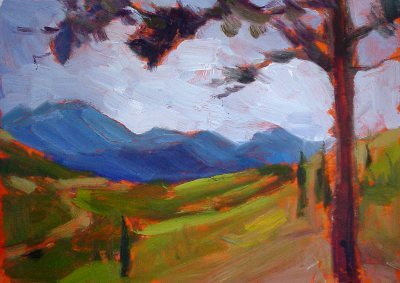 Sometimes, I even do what other famous impressionist painters did – take it back to the studio and add details to it or redo areas that I'm not happy with. 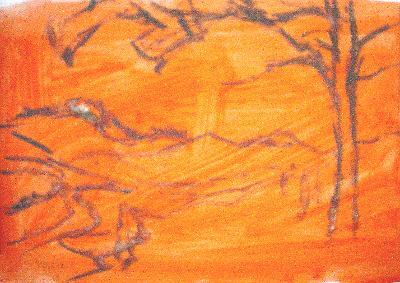 Do a small landscape or cityscape painting daily for an hour. By small, I mean around 6”x 8” (15cm x 20 cm). Start with the big abstract shapes. Squint a lot to diminish the details. Focus on getting the big shapes in the right places and with the correct color notes. Use only three or four layers of paint. The purpose is not to create a refined, finished, studio painting; it's just an oil sketch. Since you are painting wet into wet, the more layers you put on top, the more difficult it is to move the paints without disturbing the wet layer underneath. If you can be deliberate about your brushstrokes and work quickly, then your sketch's structure will be strong. To make it even more challenging, limit it to thirty minutes. The time constraint forces you to paint more efficiently. It can even help you develop stronger composition, as you will only have time to catch the major shapes. The bolder brushstrokes you develop will also enhance your art. If you do this once a day for 100 days, and you will have created 100 small oil paintings this way. At that rate, it is inevitable that you will make progress! Ready to go out to paint? Click here to view how it is done live with Richard Robinson.